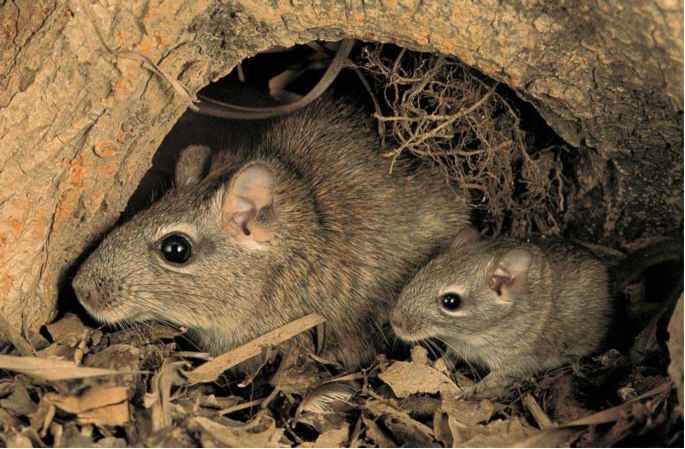 English: Singing rat; Spanish: Cocopitzu (Ecuador), pacamama (Peru). g). Stocky in appearance with square muzzle. Head is grayish beige with darker stripe between ear and eye. Back and flanks are grayish with a rusty wash, grading to pure rusty orange on base of tail and thighs. Underfur is black, and belly, chest and throat are white. The fur is soft and lacks spines and bristles. Only the base of the tail is haired. The paws are remarkably primate-like, with the third and fourth digits expanded in length and width for climbing (hence the genus name, which means "hand mouse"). Unlike almost all other rodents, the underside of the paws lack pads, and are broad and covered with hundreds of grip-enhancing, stud-like tubercles. Males have a gland in middle of the chest, which imparts a strong musky smell. The eye has a horizontal pupil, like a goat. Lowland Amazon of southern Colombia, Eastern Ecuador, Peru and Brazil. Other members of the genus are known to occur in altitudes up to 5,900 ft (1,800 m). Formerly in thick vegetation of tree falls and along river sides, this species is now common in forested areas disturbed by logging. Shows a strong preference for areas rich in vines and bamboo clumps. This species is nocturnal, beginning activity at dusk and finishing before dawn. It spends the day in vine-rich vegetation, and has two to three regular resting sites, often in leaf masses caught in palm crowns. The home range is small, recorded as 0.6 acres (0.23 ha). Movements are slow and cautious, and this species does not move far per night—as little as 148 ft (45 m). Dactylomys dactylinus occurs in pairs, and both sexes give a staccato territorial "boop...boop...boop" call during the evening. The call, amplified by the unusually enlarged larynx, is a series of deep-pitched staccato pulses well-adapted to maximum propagation in dense vegetation. The male does much of the calling, though a pair may duet. Calls are especially common in early evening, an hour or so after dusk. Males mark stems with the chest gland. If two males meet, they will make an "explosive quacking," as an appeasement call. Eats young bamboo shoots, leaves, and stems, plus a variety of other plants and fruits, and some insects. The gut has an enlarged large intestine with a pseudo-caecum. This increases the passage time of food and allows more energy and nutrients to be extracted. At 1.3-1.5 lb (600-700 g), Dactylomys is the smallest of the Neotropic's specialized arboreal folivores; if it were any smaller, it would not be able to offset the heat loss from a small body with the slow rate at which energy is received from its poor-quality food. REPRODUCTIVE BIOLOGY Litter size is two.